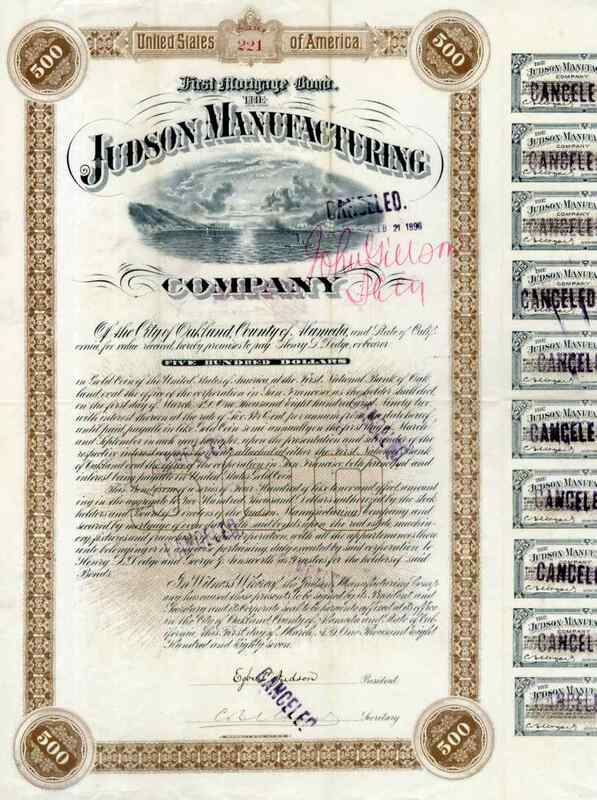 1887 Judson Manufacturing $500 Bond Certificate. Attractive certificate with vignette of San Francisco Bay. Judson Manufacturing, located in Oakland California, was founded in 1882 and was a bridge and structural steel machine shop. Certificate is signed by Egbert Judson. Egbert Judson (1812 -1893) was an important inventor and manufacturer of explosives. He organized several companies including the Giant Powder Company and Judson Powder Company, which sold dynamite in the U.S. The certificate is also signed by Henry Lee Dodge as Trustee on reverse. Henry Lee Dodge (1825-1901) was an important businessman (founder of Fireman's Fund) and political leader in San Francisco. Certificate is in VF+ condition.